Why Did Jil Sander Make A $290 Paper Bag? So. 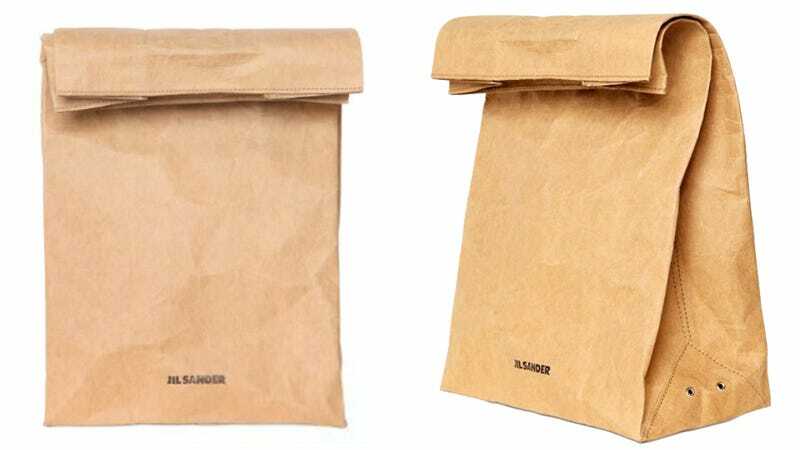 Jil Sander is selling a brown paper bag. It is made of coated paper, with brown stitching on the sides. It differs from your average lunch sack in that it has a Jil Sander logo on one side — and it costs $290. The design does two very interesting things: It doesn't venture far from the original, and it's perfectly in sync with the fashion house's minimalist roots. Forget recycling — this bag is a keeper. Does Jil Sander sell a bag I can barf in, too? Every time I read about a $500 pair of Rodarte socks, a $9,500 Fendi bicycle, a $53,500 Bottega Veneta suitcase, a $700 Margiela t-shirt, a $2,000 Louis Vuitton trashbag purse, I feel a familiar sense of disappointment. Why does fashion always end up giving fodder to the haters? These are the kinds of products that are born for scream-y New York Post headlines and incisive water-cooler conversations about the emperor's new clothes. It's not enough that the fashion industry, being a kind of capitalist performance art dominated by women and gay men, is already written off by most people as silly and frivolous. Occasionally, fashion has to go out and actually confirm everyone's worst assumptions by making a paper bag that costs $290. Where does this come from? Some kind of Freudian death drive? There is no artistry in a $290 paper bag — if it's supposed to be, I don't know, a post-post-modern joke on the nature of branding and luxury in an age of mass-produced material culture, it's still not funny. These kinds of products are just so empty. Why fashion houses keep making them, when they know they will elicit nothing more than scorn (from even people like me who actually like fashion! ), is beyond me.